The main source of information about the English Prison service before 1800 is The State of Prisons by John Howard. The end of the eighteenth century saw the beginning of a serious debate about the conditions in prison. When Howard wrote, neither the prisons nor the "Bridewells' were administered by the central government. They belonged to a mixture of authorities, predominately the local justices. Bridewells, the first of which had been established in London between 1552 and 1557, differed from prisons because they were intended for the relief of destitution, not for punishment. A difference of some importance to the inmates was that in Bridewells they were not entitled to food. By Elizabeth I's reign the common goal prisoners had acquired a legal right to sustenance. From about 1700 onwards their differences narrowed, and in most areas they became indistinguishable. Their formal differences were eliminated by the Prisons Act 1865. At the end of the eighteenth century there were three principal methods of punishment of serious offenders: they could be executed, they could be confined in the local prison or they could be transported. It was transportation and its problems which first involved the central government directly in prison administration. The Webbs state that the earliest case of transportation occurred in 1619. Although in the beginning the numbers involved were small, it became an increasingly popular practice, happily providing para-slave labour for the American colonies. By the outbreak of the American War of Independence in 1776, about a thousand criminals a year were being transported. The war put a stop to this and the central government was therefore compelled to make alternative provision, since it was not likely that the inadequate resources of the local prisons could have coped with this new problem. The problem was solved by putting the transportees in `hulks', old vessels converted for the purpose, and intended to be temporary. In 1776 the Hulks Act was passed which authorised their use for a period of two years. The first two were at Woolwich, but, echoing other `temporary' expedients in the penal system of this country, the hulks proved to be more permanent than had originally been envisaged. The hulks had always been extremely unsatisfactory places and the Convict Directors, as well as the staff in them, frequently expressed concern. Their end was expedited when the `Defence' at Woolwich was burned out and had to be scuttled on 14 July 1857. On 1 September, the old county prison at Lewes, which had been bought by the government, was lent by the Admiralty to be an invalid convict prison. The convicts from the `Defence', who had been temporally housed at Millbank Prison, and those from the hulk `Unite', were transferred to Lewes. There remained one hulk, the `Stirling Castle', which was closed in 1859. The hulks were not, however, the only solution to problems consequent upon the cessation of transportation. There was discussion about proposals to build a national penitentiary, and this discussion led to the Penitentiary Act of 1779. This Act proposed the building of penitentiaries and the establishment of a regime which was to include labour of the hardest and most servile kind, and compulsory attendance at religious services. The Act authorised the appointment of three people to select a site for the penitentiary. The three men who were chosen, Howard, Fothergill and Whatley, could not agree on a site, and this failure to agree was the first impediment in a complex of blockages, which was to include the abortive 'Panopticon', proposal of Jeremy Bentham. Much of the impetus was lost when the decision was taken to transport convicts to newly discovered Australia. The first expedition was in 1787. In spite of the renewal of transportation, interest in the setting up of a penitentiary was maintained, as were efforts to raise standards in the local prisons. In 1784, and 1791, Prison Acts were passed which applied the principles of the proposed national penitentiaries to all prisons. But the local authorities could safely ignore these principles, since the central government had no sanctions with which to support either its mandatory or voluntary exhortations. This was to be the response of the local authorities, with very few exceptions, until total centralisation. The beginning of the nineteenth century saw the emergence of a pattern of refusal to reassess priorities in the management of prisons which was to characterise the operation of the prisons by local government. It became increasingly evident as the central government developed its own network of convict establishments, that divided responsibility for prisons was unworkable. 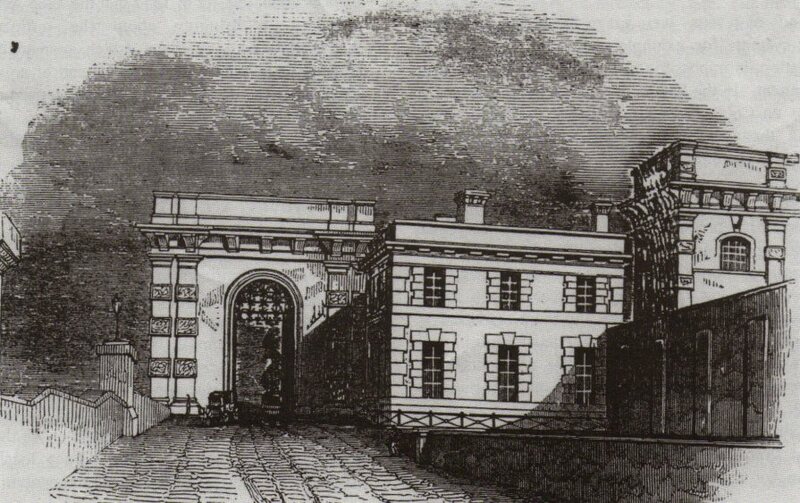 Eventually, in 1816, the proposed penitentiary, Millbank, was started on the site of what is now the Tate Gallery. It was completed in 1921, but it was `one of the most costly of all the buildings that the world had then seen since the pyramids of Egypt, the total expense from first to last amounting to not far short of three quarters of a million sterling'. Historically Millbank was of the greatest significance since it brought the central government into the mainstream of English prison administration. Although the government had undertaken the cost of maintaining prisoners in the hulks, Milbank demonstrated that the government was taking a manifestly permanent share in prison management. The new prison was the corner¬stone of an organisational development which was to culminate in the establishment of the convict service, which, in turn, was to lead to a comprehensive national prison system. And so from 1821 there were two prison `services' in England. The central service, which consisted of the hulks and Millbank, and which paid its staff and so broke with the tradition that they had to earn salaries by exploiting the prisoners. The hulks were administered by a Superintendent, and Millbank was managed by an eminent Committee, including the Speaker of the House of Commons. The local `service', or more correctly `services', were controlled by the justices. They continued to exercise restraint in reforming their prisons, since this meant added expenditure, and a resultant burden on the rates. The salaried gaoler was a rarity. In the years of the nineteenth century there was little evidence that the local authorities would be likely to allocate more money to prisons as a result of any reassessment of the treatment of prisoners. In 1815 the Aldermen of the City of London declared that: `their prisoners had all they ought to have, unless gentlemen though they should be indulged with Turkey carpets". In 1820 there was a Select Committee which strongly recommended action on prison reform. In 1822 Peel became Home Secretary, and in 1923 the Goal act was passed. The Act provided for quarterly reports by the justices to the Home Secretary, systematic inspection by the justices, payment of a salary to gaolers, abolition of private trading by gaolers, improved accommodation, supervision of females by females, and the keeping of work journals by the gaoler, the chaplain, and the surgeon, which were to be presented to the Quarter Sessions. There was also insistence upon productive labour, education, and religious observance. Although the Act was a very impressive statement of progressive policy, it was only marginally successful. It had three major defects which militated against real success: there was no machinery for enforcement, there was no inspectorate to supervise or advice on implementation, and the measure applied only to a minority of prisons - those of the country justices, of the Cities of London and Westminster, and seventeen provincial towns. The London Debtors' Prison and 150 goals in minor municipalities were excluded. The Webbs drew attention to the inexplicable fact that, for example, Bristol, Hull, Worcester and York were included, but Leeds, Dover, Oxford and Cambridge were excluded. With such defects the Act was largely unsuccessful in its attempt to stabilise the erratic prison system. The whole problem seemed so insoluble that Peel wrote on 14 March 1826 to Sydney Smith: `I despair of any remedy but that which I wish I could hope for - a great reduction in the amount of crime'. In spite of the exceptional reformative work of isolated local authorities such as Gloucestershire, which had pioneered improvements under the leadership of Sir George Onesiphorus Paul for thirty years, it became clear during the 1820's that the condition of the local prisons was not likely to improve without further direction from the central government. In 1832 a Whig Government came to power in a reformed Parliament. In all its projects of reform, it was dominated by two leading assumptions - the value of uniformity of administration throughout the country and the impossibility of attaining this uniformity without a large increase in the activity of the Central Government. A House of Commons Committee in 1832 was followed by a House of Lords Committee in 1835, which was chaired by the Duke of Richmond. As well as producing substantial reports on the prisons, the investigation led to another very important Act in 1835. This Act was: `for effecting greater uniformity of practice in the government of the several prisons in England and Wales, and for appointing inspections of prisons in Great Britain'. Five inspectors were appointed, and this inspectorate was a further major step to centralisation. Although the central government could still not enforce the advice given to local authorities, the published reports of the inspectors performed a valuable function, by constantly exposing to public view defective administration when it occurred. Their first report on Newgate, for example, gives ample evidence that the prison was in a very unsatisfactory state. The Inspectors found prisoners with considerable authority over other prisoners, drunkenness, `rioting, uproar, and fighting' and breach of the Rules of the Goal Act, which require that female prisoners shall be constantly attended by female officers'. There was `utter absence of all employment for the prisoners', and in 1853 it was an Inspector, J G Perry, who uncovered the scandals which led to a Royal Commission being appointed to investigate the use of illegal punishment in Birmingham Prison. The Secretary of State extended his influence further by an Act of 1839 which gave him certain powers over the design of new prisons, or the renovation of existing ones. The new and very important area of central influence was consolidated in 1844 by a further Act, which authorised the appointment of a Surveyor General of Prisons. All proposed building plans, and alterations to existing plans had to be referred to him. The government had increased its own resources by building Pentonville "model" prison, which was opened in December 1842. There were now two convict prisons as well as the juvenile prison at Parkhurst. The work was carried out by Mr Crawford and Mr Whitworth Russell, the two first inspectors, both very prominent prison reformers, and Captain, afterwards Sir Joshua, Jebb, RE. Jebb was also to become first Surveyor General, and first Chairman of the Directors of Convict Prisons. In the six years after the building of Pentonville, no fewer than `fifty-four new prisons were built all modelled on Pentonville, affording 11,000 separate cells'. The extent of this building makes the period one of the most remarkable in the history of the prison system. The early years of the convict service will be discussed later. A second major event in 1850 was a Select Committee on Prison Discipline under Sir George Grey. This Committee was especially important because it examined the question of the relative merits of the `silent' and `separate' systems. There had been intense argument about these systems for thirty years. This discussion appears to be about `reforming' criminals. I shall suggest later that in fact there were other more subtle and sophisticated issues in the discussion, and it is necessary therefore to describe what the `systems' were. The silent system allowed `association' for certain purposes, work for instance, but prisoners were forbidden to speak. The separate system kept prisoners in cellular isolation. They were not allowed to speak to each other, but they could talk to the governor and other officials who visited them in their cells. This rather limited concession distinguished the separate system from solitary confinement, where isolation was complete. Although the opinions offered to the Committee reflected conflicting views about the systems, the Committee expressed itself in favour of separation. All kinds of reasons were given for preferring it to a silent system: for example that a silence rule, in association, is impossible to enforce without excessive punishment. In the Second Report of the Inspectors of Prisons on Coldbath Fields for 1836, it is pointed out that in the year there were `no less than 5,138 punishments for talking and swearing. While these debates about regimes were going on, there was increasing pressure on the convict prisons. Once again transportation was proving difficult. The concern in England about the justice and efficacy of transportation was matched by an increasing reluctance on the part of Australia to take any more convicts. A Parliamentary Commission on Transportation, the Molesworth Committee, in 1837-1838 condemned the practice and recommended detention in penitentiaries instead. In 1840, the government announced that no more convicts would be sent to New South Wales and the last ship arrived there on 18 November 1840. In 1853 an Act was passed which allowed substitution of a sentence of penal servitude, which could be served in England, for all crimes punishable by transportation for less than fourteen years. In 1852 transportation to Van Diemen's Land (now Tasmania) was stopped. In that year 1,844 convicts were transported. The crisis was slightly eased by the co-operation of South Australia, which agreed to continue taking convicts in 1850. Less successful was a remarkable attempt to land 300 convicts on the Cape of Good Hope. This was `resisted' to the point of rebellion'. In 1867 transportation to Western Australia ceased, although ten years later, there were still 630 convicts there in various stages of imprisonment. In 1850 Sir George Grey reported to Parliament that there was accommodation for only 12,900 convicts, `while nearly 5,000 were sentenced to transportation every year'. In 1865 a Prisons Act was passed which intruded even further into the administrative independence of the local authorities. It `constituted the turning point of English prison Administration in the second half of the nineteenth century'. The provision of the Act were based on the recommendations of the 1863 Committee. Two are of especial relevance to this account. The first is that the Act decreed a staff complement which had to include a gaoler, a chaplain, a surgeon and a matron for women (job specifications were set out in great detail in Schedule I) and forbade the employment of prisoners as staff. The second is that the grant from the central government to the local authority could be withdrawn if the latter failed to comply with the Act. The Secretary of State was also empowered to close an inadequate prison. But, as Du-Cane pointed out, this could not have been done unless another authority was willing to receive the `redundant' prisoners. The government seems to have decided in the light of its experience with local authorities, that the only effective sanction would be withdrawal of finance. It was to be claimed in the debates about the Act of 1877 that the 1865 Act was not effective in bringing about the uniformity of management and treatment which seemed desirable. Nevertheless it marked clearly the end of an aspect of local autonomy which had been characterised primarily by a refusal to observe even the minimal conditions of care for prisoners which the government laid down. Nor was the central government going to let the matter rest. This increasing influence of the central government in the administration of prisons had its parallels in other developing social and welfare services. In fact, the prisons were a minor issue compared with more important controversies, such as the administration of the poor law, or education. Nevertheless the several Prison Acts, and the activities of the inspectors, all contributed to the increasing involvement of the central government in what had hitherto been local affairs. After 1832 this involvement gained momentum quickly. The Prisons Act of 1877 like other legislation, such as the Education Act of 1870, the Mining Act of 1877, and the Factory Act of 1878, was an inevitable `consolidating measure'. Nevertheless in its transfer of power it went further than any other had ever done, or would ever do. The Times, which in principle consistently deplored centralisation, supported the Act in practice, as it did almost every other similar reform. In approving its enactment on 12 September 1877 it pointed out that it had taken: `all the vigour and energy of Mr Cross to get it through'. The kernal of the Act was the transfer of every aspect of prison administration to the Secretary of State. He became responsible for all the prisons, their furniture and effects, the appointment of all the officers, and `the control and safe custody of the prisoners'. A new body, the Prison Commission, was appointed to operate the new department. There was to be a maximum of five Commissioners, one of whom could be appointed Chairman. The Commission took on the detailed administration which had hitherto been carried out by the justices; in particular the Commissioners were to appoint `subordinate officers' and had to make an annual report to the Home Secretary. This was to include details of manufacturing work carried on, and particulars of punishment which had been administered. The Inspectorate was to remain to assist, and its members were to be appointed by the Home Secretary. The justices were not entirely excluded from the local prison. Any justices, who had jurisdiction in either the place where a prison was, or where an offence had been committed by a prisoner, could visit at any time, could inspect the prison, and could enter observations in the visitors' book. In addition there was to be a Visiting Committee of Justices, appointed by the Quarter Sessions or Magistrates' Benches. The duties prescribed for this Committee have remained substantially unchanged in the last ninety years. They were to visit regularly, listen to complaints - in private, if requested - report on abuses and so on. Ideally therefore they could act as a restraint on the excesses of the administration. A prisoner could complain to them, and since they were no longer in charge, they could afford to be impartial. In theory, prisoners were given extra protection because of the establishment of the Visiting Committee. With this Act, about 800 years of local control over prisons was brought to a close. The English Prisons had been insecure and squalid even by the standards of the age. The names of some - Newgate for instance - were bywords for corruption and misery for hundreds of years. Prison administration had not been one of the brightest episodes in the history of local government, and it was difficult to imagine how prisoners could fail to be better off under the central government.